Capture screen and label the screenshot with Annotation Pilot. Save your screenshot as a graphic file or send it by email. With Annotation Pilot you can: send a photo with annotations to your friends; send a software error message or a bug report to a developer; show a screenshot of your favorite program to your friend; create a map with directions (e.g. 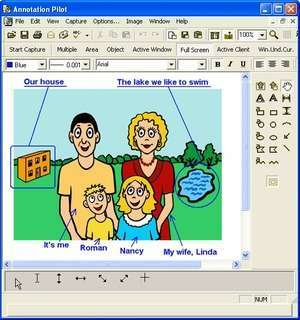 Annotation Pilot 1.47 is a shareware program and can be used as a demo to try the software until the free trial period has ended. A full version of the program is available after the trial period ends. For security reasons, you should also check out the Annotation Pilot download at LO4D.com which includes virus and malware tests. Additional screenshots of this application download may be available, too.